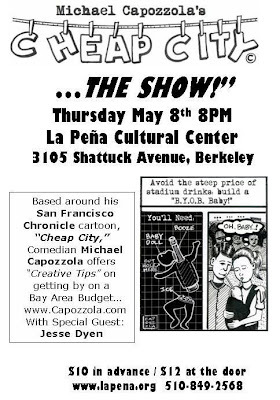 My good friend and fellow cartoonist and stand-up comedian, Michael Capozzola, is doing a comedy show in The Bay Area soon. Check out the poster below and PLEASE GO! Your geography is a bit bizzaro too! Berkeley is in Berkeley, not in San Francisco. Across the Bay, in Alameda County.